I have always been a strong believer in the U.S. Constitution, but I our political system could use improvement. I feel honesty and integrity are good principals to follow, coupled with a healthy dose of common sense and engineering problem solving. I believe that American innovation will need to continue if we are going to remain a great nation. This will need to be done in government too, not just in industry or the academic community. 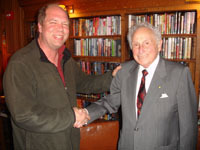 I have several passions, theses include solving complex problems, starting fun innovative companies, teaching entrepreneurship, research chaos theory and fractal geometry , jungle and volcano trekking, sailing, photography, telling stories about computer history, and reading (I plan to read Mark Twain's autobiography). 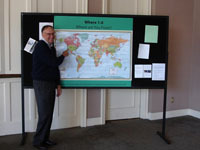 I am currently in a race -- with a colleague – to visit 100 countries and all seven continents. I am only 58% of the way there. I hope one day to visit the Wahl Glacier in Antarctica named after my father for his research work there. I am a strong abdicate of our National Parks, in 1994 I helped create their first web site. I plan to use scientific principles to address our city's civic issues with a touch of imagination in planning what it could be. Hobbies: photographer of the Olympic Games, building alternative energy systems and inventing gadgets, writing books on Chaos Theory and Fractal Geometry, making documentaries, traveling and lecturing, visiting new lands. 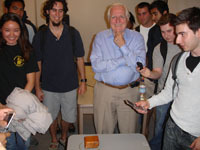 Doug Engelbart is showing his wooden mouse in my IEOR 190C class. I call the photo "Celebrity Mouse". In 1969, Doug Engelbart 's group showed what computer collaboration could be. He help invent the Internet, the mouse, hypertext and many other inventions. Dr. Engelbart received his PhD from UC Berkeley and went out to change the digital world. There is a group "We Care Solar" run by two friends Dr. Laura Stachel and Melissa Ho bring solar lighting and power to remote African hospitals. 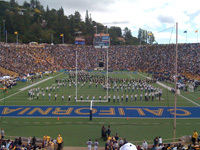 Berkeley is the home to many organizations that are having a global impact. Benoit Mandelbrot and 3 other pioneers of modern fractal geometry. Their work made great contributions to science. Fractal mathematics help launch Pixar and my first company Dynamic Software. I learned a great deal spending time with them. 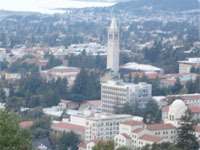 Berkeley is home to MSRI, the nation's Mathematical Sciences Research Institute. 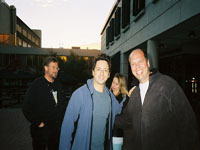 While at UC Berkeley we started a computer group BMUG that grew to be 13,000 members worldwide. 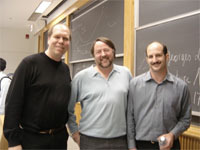 Reese Jones (center) would go on to found Farallon and Netopia, and Eric Brewer (right) would found Inktomi (Yahoo's search engine). We are still all active at the university. Dean Kaman is a prolific inventor. Besides inventing the Segway, he created the first insulin pump, a bionic arm and many other inventions. 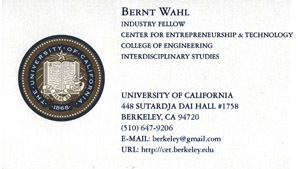 Here he is hitting me up to try to recruited our best engineering students to work for his firm DEKA. Stanford R. Ovshinsk is the modern father of nickel-metal hydride battery and several solar technologies. His work has made great contributions to science, especially in reducing our carbon footprint. California's economic strength has in large part come from our commitment to education, especially higher education. One of life's great joys is having your past teachers (some from decades past) want to hang out with you. I am often invited back to give talks for the physics and mathematics student at my undergraduate calamander UC Santa Cruz. 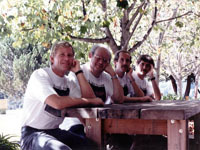 From left to right: Ray Larson, built Inktomi's engine, Sergey Brin co-founded Google, Marti Hearst was involved in PowerSet (Bing) and Wahl tried to take over Infoseek . Many search engine companies were founded in the Bay Area including several from Berkeley. 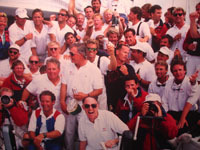 In 1985, I was part of the America's Cup sailing team, Heart of America. We were trying to win the Cup back from the Australians. A few years later the team as America 3 would reclaim it. It was nice that the America's Cup came to the SF Bay. 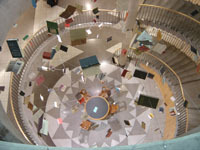 It hopefully inspired students to be interested in STE(Art)M subjects. On occasion I hang with some friends from the film studios too. 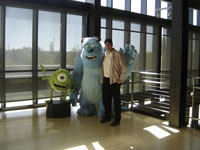 Here I am at Pixar Studios in Emeryville. Pixar provides jobs to many that live in Berkeley, as well as great enjoyment with their movies. Jimmy Wales started Wikipedia. 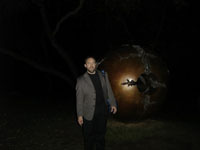 I had him pose with a statue at the base of the U.C. Berkeley campus as we walk to BART, it reminded me of the Wikipedia Globe. It is great how popular the online encyclopedia has become. 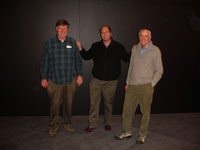 Here is a picture of three UC Berkeley graduates who like to dance (Steve Wozniak, Bernt Wahl, and Doug Engelbart) and in their spare time work on computers. 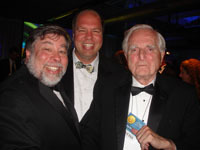 Woz was on "Dancing with the Stars" and co-founded Apple computers. Frankie Manning inventor of the swing dancing "Ariel" in 1930's. It was always a treat for us at the N.C.L.S. 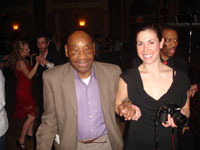 when he would come to the Bay Area to show us some cool " Lindy Hop" moves. Here Mr. Manning is at Ashkenaz Music & Dance Community Center a long time Berkeley landmark. As a boy I always had a fascination with space exploration. 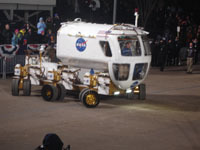 Here is one of NASA's planetary rovers that was displayed at the Presidential Inauguration. Scientific research employees many in Berkeley and is crucial to developing future technologies. It is always fun to cheer for the home team, especially at the Big Game. These games also bring in many alumni and others to see the games that helps our local economy. 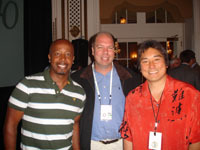 M. C. Hammer (Dance Jam), Bernt Wahl and Guy Kawasaki (Garage Technology Ventures). Each has been involved Silicon Valley startups.The future for growth in the economy is innovation. UC Berkeley's CET helps bring some of that innovation to help start local companies. 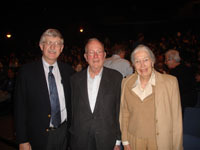 Collins lead the Human Genome Project and Townes invented the laser which won him the Nobel Prize and a coveted parking spot on the UC Berkeley campus. The Townes Family live and teach in the Berkeley area and contributed greatly to our community. 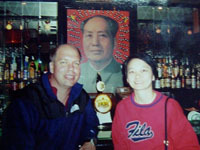 Cheng Ming Yu uses economic principles to help the developing world. On our recent trip to China, Dr. Cheng attended the Young World's Leader Forum while while I lectured on IT entrepreneurship at Singhua University's Marxism School of Economics. 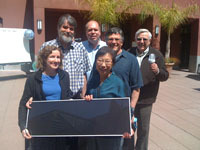 Shared collaborations help bring global ideas to Berkeley. 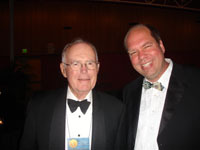 Jack Dangermond is great guy, he started ESRI and for over 50 years has been trying to convince the world that GIS could really help manage the earth's resources. I think the world is beginning to listen. GIS can be useful in providing city services (citizens could use their smart phones to report items from pot holes to crime). This planter is one of my favorite student projects. 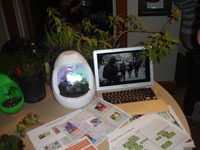 A computer can control the amount of light, water and nutrients a plant gets. It can also give you time-lapsed images that get put on your Facebook page. Berkeley startups are a good source of new jobs. 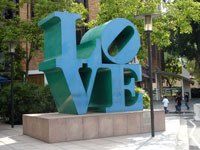 LOVE and ART make you think and feel. Used properly it can greatly benefit us all. Our downtown with its arts and theater district have been a fine city asset. Dr. Moore saw the advantages of enhancing technology. He founded Intel and predicted that computing power would more than double every 18 months. His idea would be known as Moore's Law. 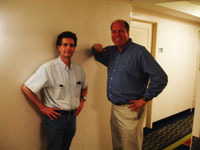 He is also a graduate from UC Berkeley and his firm Intel had the research lab downtown that became the Skydeck. I still am a classic Beatles Fan, but growing up I also like Boston, Lynyrd Skynyrd, Journey, Steppenwolf, Toto and Santana. 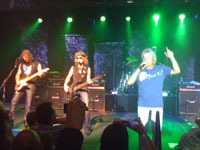 It was big thrill for me to hear these band's lead singers on stage all at once. Near the end even had the chance to get on stage and sing two songs with them. The Bay Area continues to enjoy a strong music scene. I have always enjoyed reading. There is just something about sitting down with a good book. It is sad that Berkeley has lost several great bookstores recently. 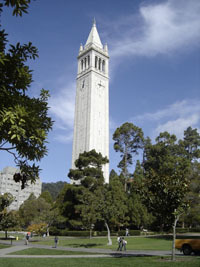 Berkeley is however still blessed with strong public and university library systems. I enjoy adventure travel, I have visited 58 countries so far. 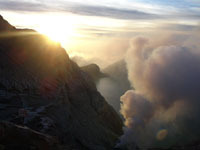 I took this picture in Java as the sunset hit. Our areas enjoys a high concentration of adventure travel companies providing good jobs. Berkeley, California is a great place to live and learn. In 1972, the Lawrence Hall of Science provided my first real exposure to computers, a rare event for a 6th grader back then. What memerable technologies can we showcase to our children? Perhaps we show a house powered by the sun and wind, that catches rain water, built from sustainable materials. Who knows whom this may inspire to build the future world?